Talks supposed to encourage professional air and sea conduct, but unsafe incidents persist. Senior delegations from the Chinese and the U.S. militaries met in Honolulu last week for annual talks on improving the safety of maritime and aviation interactions. 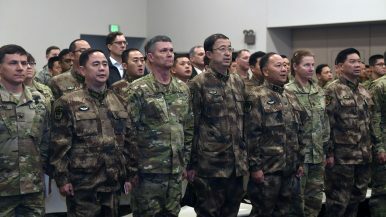 Both the United States and China tout the meetings held under the Military Maritime Consultative Agreement as a means of improving trust and communication between the two militaries. The talks are also a forum for ensuring that interactions between their ships or aircraft are safe and professional, but “unsafe” intercepts of U.S. surveillance flights by Chinese jets persist. Nevertheless, the lead U.S. representative, Major General Joaquin Malavet of the U.S. Pacific Command, said that “by continuing to improve our communication via mechanisms like this we can ensure safe interactions at sea and in the air.” And speaking just prior to President Donald Trump’s recent visit to China, a Ministry of National Defense spokesman told reporters of China’s willingness to “deepen mutual trust, focus on practical exchanges and cooperation and appropriately manage and control disputes, to continue injecting positive energy in the development of ties” with the U.S. military. The disconnect between the two countries’ rhetoric and the tension on display in the skies underscores the limits of promoting understanding when there are intractable policy differences. The United States maintains the right to conduct its surveillance unmolested in international airspace, while China maintains the flights are a threat to its security and tries to either interrupt or dissuade them with airborne brinksmanship. For the United States, the talks were supposed to ameliorate China’s occasionally aggressive tactics. The two countries signed the Military Maritime Consultative Agreement (MMCA) in 1998. Following tensions during the Taiwan Strait Crisis in 1995-96, the United States hoped it would be a framework for preventing incidents that might escalate out of control, but in the end the agreement simply resolved to hold further talks on maritime and aviation safety. In 2014, those talks finally produced a Memorandum of Understanding on rules for maritime and later for aviation conduct. The implementation of the rules is now discussed as part of the annual MMCA meeting. Despite U.S. hopes that the terms of the understanding would reduce the risk of dangerous maneuvers like the one that resulted the tragic 2001 collision between a U.S. surveillance plane and a Chinese fighter jet, U.S. complaints of Chinese aircraft executing unsafe maneuvers around U.S. surveillance aircraft have not abated. Last week’s agenda included a review of such intentional incidents over the past year. At least three are known publicly. In May, two Chinese jets intercepted a U.S. Air Force radiation-detecting aircraft over the East China Sea at high speed. Later that month, two Chinese jets intercepted a U.S. Navy surveillance plane over the South China Sea within two hundred yards in May. Another U.S. Navy surveillance plane was intercepted within 100 yards over the East China Sea in July. Whenever the United States publicly accuses Chinese aircraft of an unsafe or unprofessional intercept, China generally counters that it’s aircrafts’ actions were both safe and professional, and that it is the United States’ surveillance flights that create unsafe situations. The situations described by U.S. officials support their safety concerns, but the Memorandum of Understanding’s subjective language gives Chinese officials the standing to claim that they remain in compliance with it. The section describing the “safe separation” that aircraft should aircraft should observe does not specify an actual distance, but leaves the determination up to the pilots involved based on their own national rules and the mission, among other factors like the weather and flight situation. Under that criteria, China can, and presumably does, claim that their pilots’ actions were justified by their mission, and were conducted safely – at least as the Chinese military defines the term. Lacking any enforcement mechanisms, or even enough specificity to unambiguously declare China’s intercepts to be in breach, the memorandum between the U.S. and Chinese militaries is unlikely to be the remedy that the United States seemed to hope it would be. As for the annual talks, both parties presumably already understand this much: that the United States wants to surveil the Chinese coast, and that China wants that surveillance to stop, and that their mutual desire for airborne and maritime safety is ultimately less than either side’s attachment to those mutually exclusive policies.